I rarely venture out on the river these days, simply based on personal logistics. 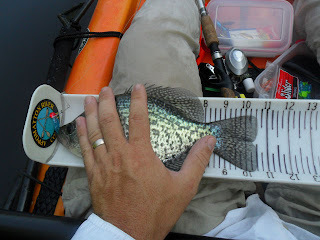 Rarely are there people I know available to fish with me on my Fridays off, so I tend to stick to bodies of water that I can paddle and return to the launch with minimal challenges. Well, this past Saturday, I had the opportunity to fish with a group of people that I volunteer with for the Central VA Chapter of Heroes On the Water. 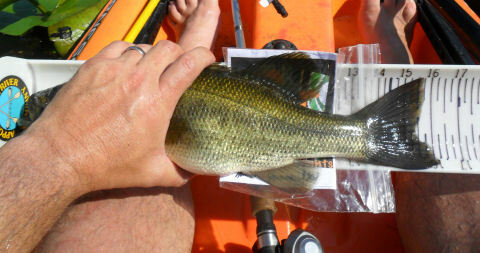 In all, there were 21 kayaks at last count launching at the Scottsville site and taking out at Hardware. It was an all day float scheduled with a lunch break on the river at some point. The day started off slow with a morning fog that was still burning off from the rain that had moved through over night. 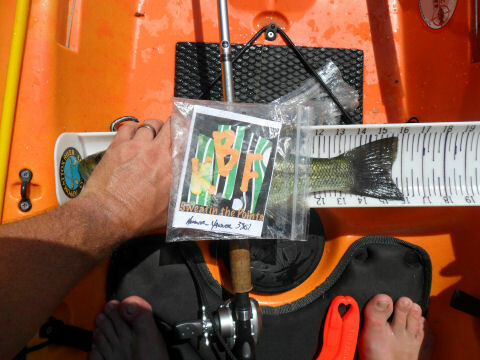 I started off working the banks with a bream colored Secret Weapon Lures double bladed spinner bait, a single bladed Strike King Rocket Shad in perch color and black Strike King mini-Pro buzz bait. I worked these both over submerged grass beds and ledges with no success. I switched up tactics and started tossing a Strike King Red Eye lip less crank towards shore and retrieving it back across the leading edges of the ledge rock and deeper pools. After a few minutes of this approach, I welcomed my first smallmouth bass of the year - a feisty little 10" runt. 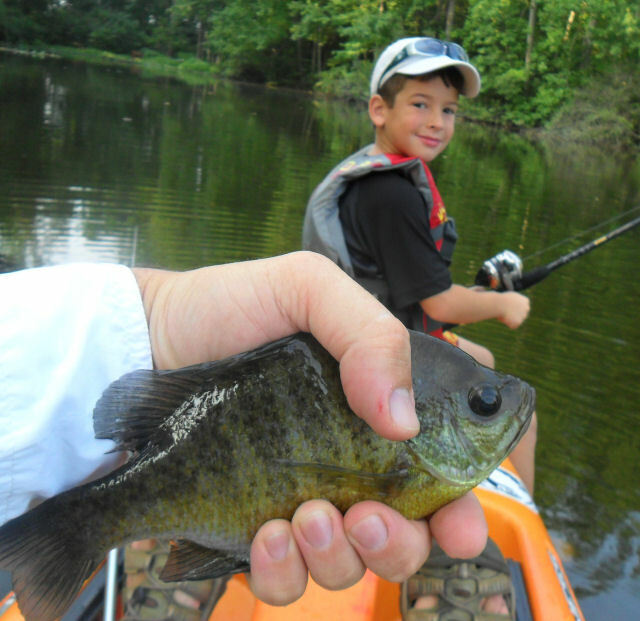 He attacked the Red Eye as soon as it hit the water. I barely had time to engage the spool before he took off with it. He had some beautiful markings though and was quickly released unharmed to go back and get bigger. I continued with my approach and was greeted shortly after with another smallmouth bass - only this one had a bit more fight to him and a little better size. 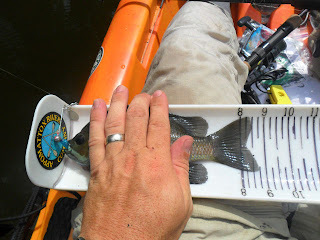 In the end, he only ended up being 14", but at least they were getting bigger. Another beautiful fish. Figuring the bite was an aggressive one, I continued this approach even throwing a pearl fluke over submerged grass beds and switching it up to a SPRO Aruku Shad Jr. in Old Glory color but ended up with no more luck. 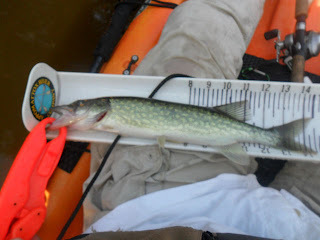 I had several followers and even hooked into a nice 24" gar that came unbuttoned half way back to the kayak. I later learned that the pattern that worked for most people was working the shaded areas where timber was present causing slight current breaks. The sad part is, I had specifically bought a small football jig in a green pumpkin color to be used with my Net Bait Baby Paca Craws for this trip, but I never listened to my fish brain. Doh!!! 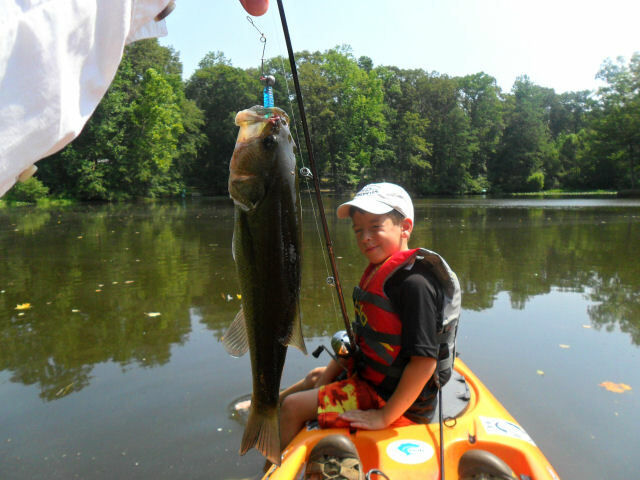 Most people who had success were using the new smallmouth lures created by the folks at Confidence Baits and Winco's Custom Lures. 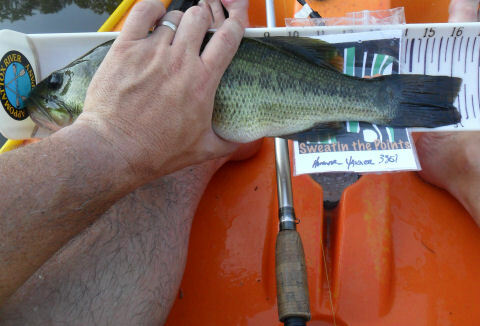 The Confidence Bait of choice was the new Little Tube, while the Winco's bait of choice was the new Predator Craw rigged on the Flutter Head jig. 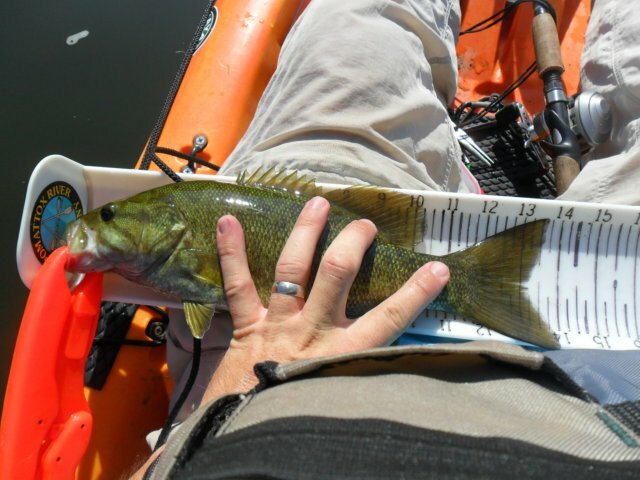 I will be adding these items to the smallie arsenal soon, but I was just happy to be able to land a couple this year for the first time. 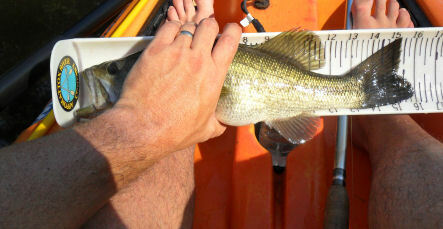 Lessons learned for the day were: summer time tactics for largemouth and smallmouth are not that different. 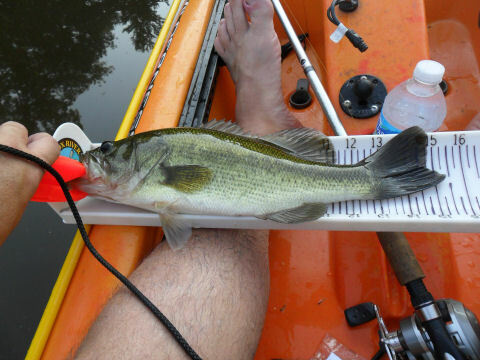 If I had taken the time to not over think what I was doing, I would have stopped long enough to work some of those shaded structure spots I heard my fishing senses try to tell me held fish. 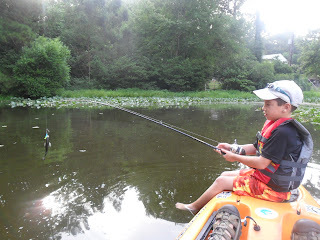 I was too caught up in truly "floating the river" versus fishing the river. 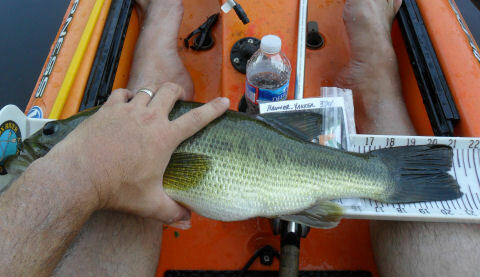 Chalk it up to a lesson learned for the next time I venture out in search of smallmouth bass. 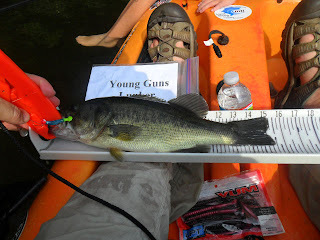 Then the excitement began - all the strikes so far had been the moderate "slurp and pop" you hear from top water frog bites. As I rounded a small tree that was sticking out over the water, I made a cast to a couple stray pads sitting away from the shore and was promptly greeted with a massive "FLUSH" and "eruption" strike - the tell tale sign of a big ole' bucket mouth strike. I saw the strike and knew if was a better fish that any so far. It took me about 45 seconds to get the ole' girl in but she had inhaled the Ribbit and was none too happy to say the least. 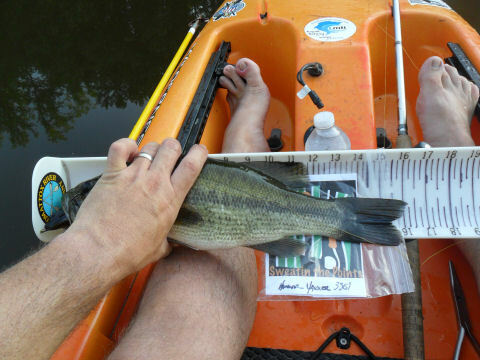 I ended up landing my personal best Largemouth Bass out of a kayak - a 21" hawg!!!! I have landed bigger ones from shore but never in a kayak - not anymore!!! My Black Ribbit is getting pretty torn up at this point, and the sun is getting higher in the sky, so I decided to switch to a brown and orange colored Ribbit. 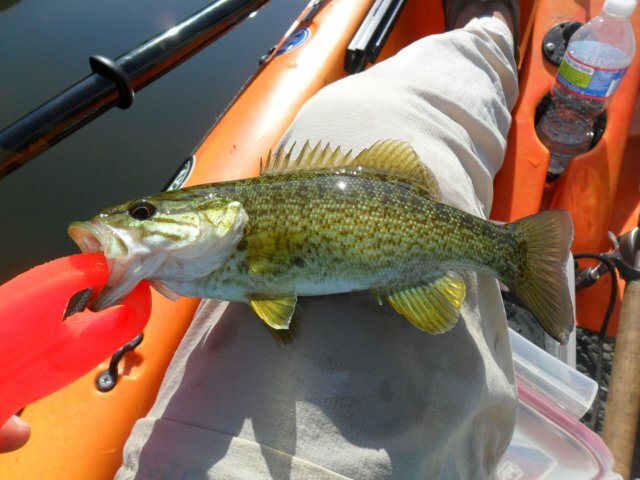 Shortly thereafter, I heard a loud ruckus in the pads near the shoreline, so I paddled over and noticed the tell tale swirl activity of a feeding bass. So I made a soft cast just past his spot and landed it on a pad. I didn't even have time to get one full crank down before he clobbered it!!! 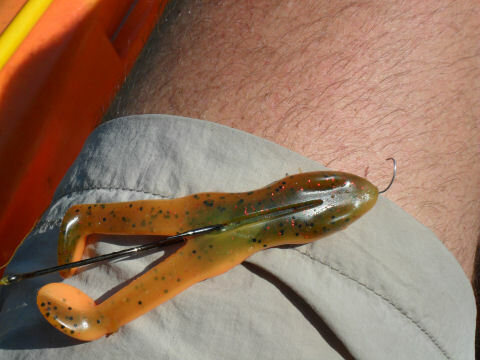 He had hit the frog so violently, he popped the hook clean out of the frog, ripped the screw lock off of the Zoom Horny Toad hook and straightened the screw lock . Pretty cool I thought. Anyway, I started making my way back to some other spots I had not fished as well as I wanted to. Throughout the day, I promised myself that I would stand anytime I started to get the slightest bit uncomfortable (I also left my inflatable donut ring at home as well ). I called it a day after that - the paddle was scorching to the touch, I was getting pretty hot in the 103 degree heat and I needed some lunch. Getting schooled by a First Grader!!! 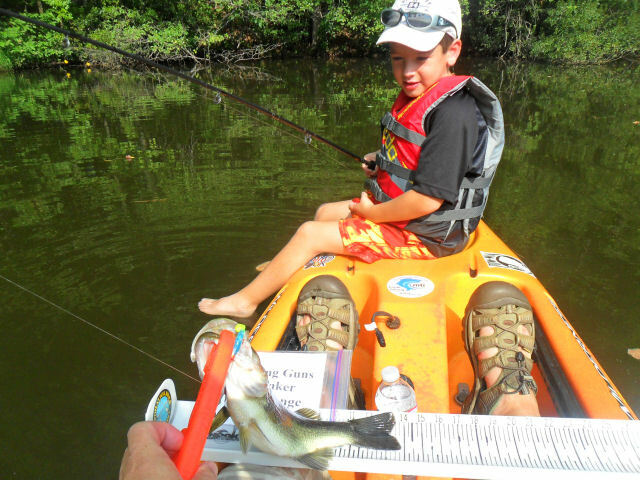 All morning long I hear......"Daddy you're not catching any fish, because you're not using the right color. You need to use the blue like me." "Daddy, I can catch them for you if you want. Here Daddy cast over here......"
"Daddy, you should probably put the blue one on cause that's what I'm using and catching all the fish." Lord grant me the ability to remain humble and bite my dang tongue - any more humble and I wouldn't have any tongue left . 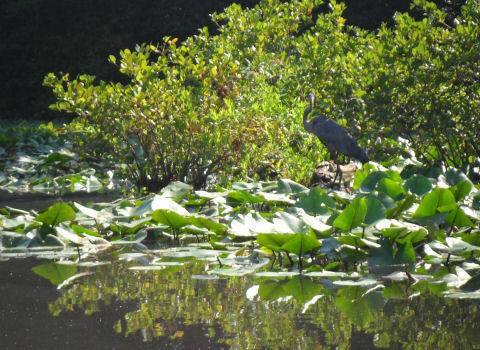 The weekend started with a quick trip to the commercial ponds we frequent on SAT morning. He out fished me 7-6. A sign of the things to come for the weekend. SUN morning comes, and I already have everything loaded for a kayak trip. Should I take him to pond #1 or pond #2........let's do #1, since I just fished #2 two Fridays ago. 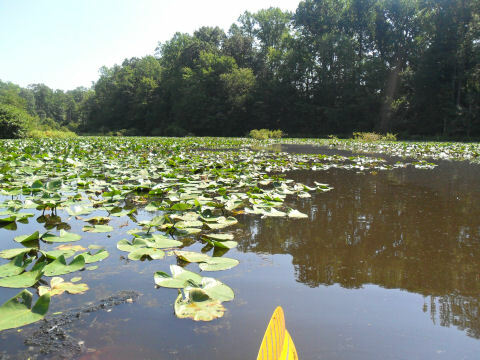 Anyway, we paddled back to some pads where I saw some fish rolling and even had one swipe at my frog but no luck. As we made our way back around the first shallow point, he hooks into fish #1 and it was on like Donkey Kong for him, He landed 21 fish to my 4 - the only time I caught fish was when his royal highness was gracious enough to let me use his rod because (and I quote) "Daddy, you can use my rod, because my hands hurt from reeling in all of those fish."